There’s a huge variety of Banksia species, all with spectacular nectar rich flowers. Parrots will love the flowers, seed pods, branches and foliage of any Banksia. Banksias are a staple seasonal food for many Australian birds, including parrots. Nectar feeders like Lorikeets flock to Banksia shrubs and trees when they’re in flower, and following this stage, when the flower progresses to a woody seed cone, cockatoos then have a feast. Banksia species are spectacular plants and are iconic and easy to recognize. There are many different species, and in addition there are hundreds of cultivated varieties. Some Banksias grow in swampy ground, others in sand, some will do well in a variety of soil and climate types, while others are very particular about where they will grow and thrive. It is well worth trying to grow your own banksia plants at home. Not only are they a spectacular addition to any garden, but your parrots will benefit immensely! All parts of Banksia trees and shrubs can be given to parrots. All birds will love the flowers, and larger parrots enjoy getting into the woody seed pods, which differ in size between different species of Banksias. The branches can also be used as natural perches. 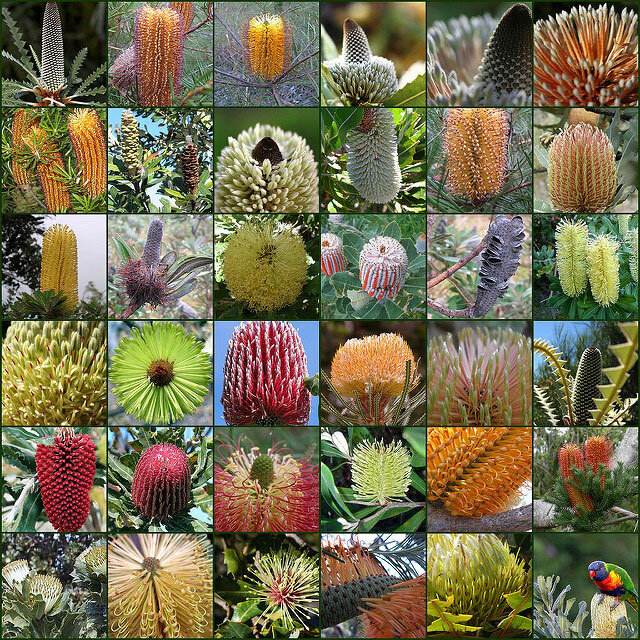 There are over 170 species of Banksia plant currently recognized. Below is a guide to some of the more commonly found ones, and those that you’re more likely to come across in plant nurseries that you can buy and plant yourself! Known as the Heath Banksia, this plant produces beautiful orange-red flowers and grows well in dry soil. It’s also quite salt and frost tolerant. This species is often cross bred in horticulture with Banksia spinulosa, producing a lovely shrub with long thin orange flowers. Commonly known as the Silver Banksia due to the beautiful silver coloured underside of the leaves. A very variable and adaptable species of Banksia. It is able to grow in a variety of climates and soil types, and can range in size from very small to a small tree in height.